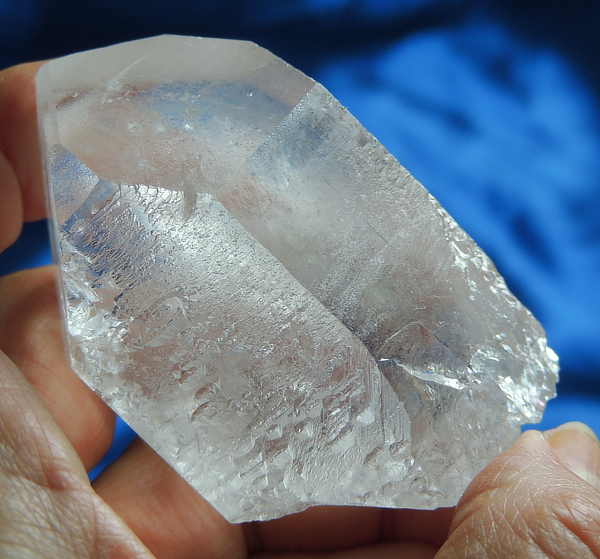 This Spirit is from Serra do Cabral, Brazil and are unusual dissolution quartz in that they are both somewhat opalescent and almost “melted” in appearance. Dissolution quartz are created within the Earth by the action of Earth acids through the eons … each is unique in expression and each bears a different message, bound for a specific Keeper. This very clear Spirit is 4.1 oz and 2.4” by 1.7” by 1.4” with an irregular, slanted base. Check the terminal faces with a loupe and you’ll see loads of teeny trigonic record keepers as well as weird lines and strange glyphs! They are so thick in places that some are on top of others and they form unusual patterns. To her back, there is a deep key and a healing ding that happened when the key separated. You can see on the sides where she once had Lemurian lines now obliterated by a marvelous display of unusual starbrary glyphs that have been eroded into even stranger language. She is in very good condition (excepting the previously mentioned ding) and her energy and beauty are wondrous!